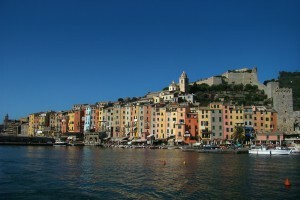 Portovenere is one of the most famous italian seaside resort. The Romans already knew this village, so colled for the presence of a temple consecrated to Venus, the goddess of beauty. During the Medieval Age, it was feud of the Lords of Vezzano, then it passed under the control of Genoa, during the 12th century. It was heavily damaged in 1494, when attacked by Alfonso of Aragon’s fleet. The “Castrum Vetus”, the first real urban centre, that is actually disappeared, was closed to Saint Peter’s Church. In 1139 Genoa began to built the zone aroun the modern Cappellini Street, and it strengthened the defences of the village thanks to a new castle and some stately town-walls. Houses have generally two entrances, one facing the beach for the boats and another facing the street, the typical “carruggio” that runs parallel with the coast, but on a higher level. All around the church there was a monastery of the 6th century; on the external part ther are all the typical characteristics of the ligurian gothic style, such as the black and white strips hangings. Here, there’s the tower of the left Presbiterial Chappel. Inside the village there’s Saint Lorenzo’s Church, erected in 1116: it’s a romanic church, with a hut face; the Saint, rapresented during his martyrdom on a grate, is located into the doorway lunette. In 1130 the church was consecrated by Pope Innocenzo II, but it was finished only in the second half of the century. Destroyed by a fire in 1340, it was rebuilt in gothic style with a bell-tower over the presbytery. It was damaged by the Aragoneses in 1494, so that it was totally tranformed, during the 16th century, in a bombastic baroque style; only in 1934 there were careful restorating works to bring it again to its original state. Inside the church people can admire works of art of the 14th and 16th century, goldsmith’s wares (such as 3 Syriac jewel-boxes and a Bizantine one, of the 9th century). Codes, sculptures and paintings, all preserved into the vestry. Above the church there’s the massive Muzzerone Fortress, with its polygonal structure, that follows the shape of the hill. It was built by the Genoese during the 16th century and strengthened in the 17th one. 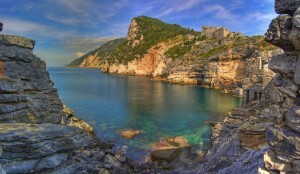 Another evocative place of the village is “Byron’s Cave”, into the sharp rocks of the coast toward the Cinque Terre: it’s dedicated to the famous 19th century english poet Byron, because it was a place of inspiration for its poetical works, also if he really never visited it. Its original name was “Arpaia Cave”. 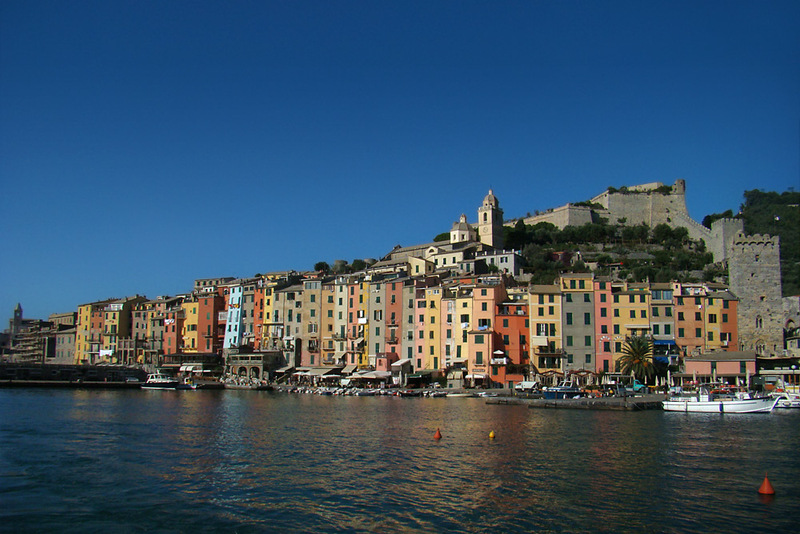 The main feast in Portovenere is that of the “White Virgin Mary” on the 17th of August. 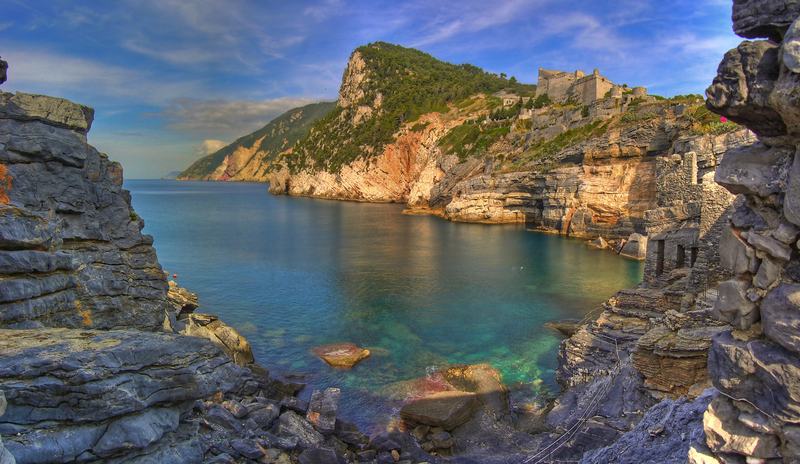 According to the tradition, the 14th century parchment with the image of the Virgin and the Infant Jesus between Saints Antonio and Cristoforo, arrived in Portovenere in 1204 with other sacred relics.